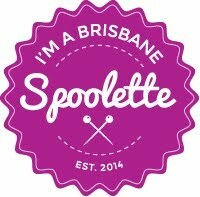 Saturday 28th March was the Brisbane Spoolette's 2nd high tea meet up. It was also my birthday so double bonus.... I get to celebrate and have fun and I don't have to do anything! (I also had a 50th birthday party immediately after which was great fun also). I wore my Style Arc Alisha dress and got many lovely compliments... thanks ladies! I was RACKED with indecision about what to make... even at 10am I was thinking I could make something simple but still could not cut into anything. (It's been a busy time around here and it's slowed down from yesterday thank goodness). It's not finished here... he was so excited .... I needed to finish one side of the zip, hemming and the binding bit on the neckline. We have two winners in fact. Alex LOVED the sweatshirt and Colesworth commented knowledgeably that it was Adventure Time show copy. When Alex came in on Sunday night and saw it (not quite finished) on the couch, he was happily shocked it was "so good". When I told him I was making it for him on Saturday, he was being very polite and said "oh, thanks Mum, but no offence, I don't think I'll take it". He's at that age where perception is very important - if it was anything other than perfect, I knew he wouldn't wear it. I was very happy with his reaction. Such joy in making him happy! This is the finished result... not much there.. enough for us for a while though. I'm not a fan of plum sauce normally but that's more because of added extras I don't like. What does it go with? Any hints? Any ideas what costume I am making?